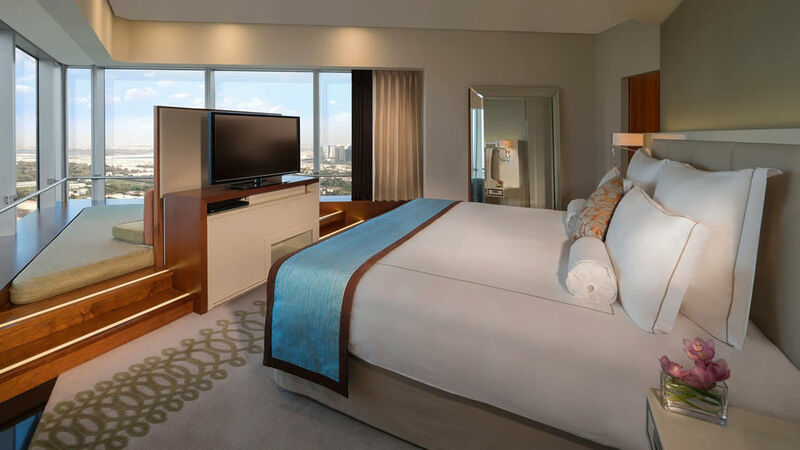 A spectacular sight reaching tall on the Dubai skyline, the Jumeirah Emirates Towers Hotel redefines business and leisure breaks in the midst of the city. The premium resort for business, there are 400 spacious rooms and suites, superb shopping via the resort's Boulevard and unlimited access to Wild Wadi Water Park and the private beach. The resort is situated five minutes from Dubai Mall, dining and nightlife in addition to Jumeirah's excellent alternatives. Fitness and spa services combine with fabulous restaurants and night life - perfect after a corporate event held right here in resort. There’s a complimentary shuttle bus to the stunning golden sands Jumeirah’s very own private beach. 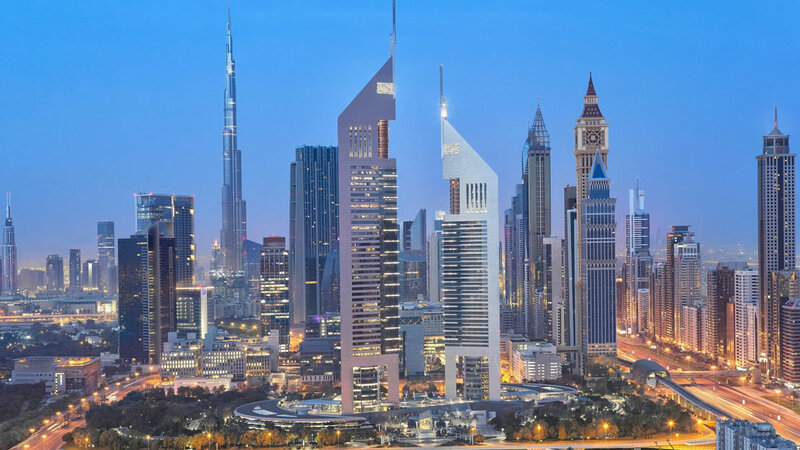 Jumeirah Emirates Towers is perfectly situated for easy access to downtown Dubai, where you’ll find the tallest building in the world and Dubai Mall – it’s just 2km away and the hotel has a free shuttle service to take you there. Dubai Creek Golf and Yacht Club is about 7.5km away. Dubai International Airport is approximately 11km away from Jumeirah Emirates Towers. Floor to ceiling views in a fabulously comfortable space offering the standard provisions, plus a few finishing touches. 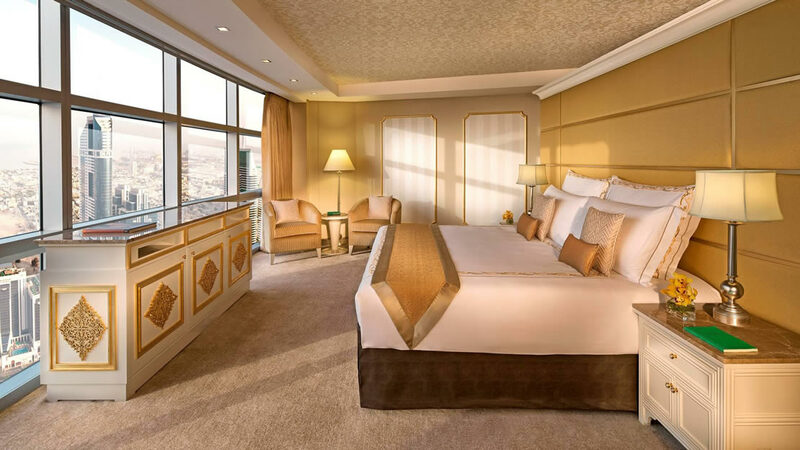 Deluxe rooms are perfect for enjoying panoramic views of Dubai and the Palace stables after a busy day. 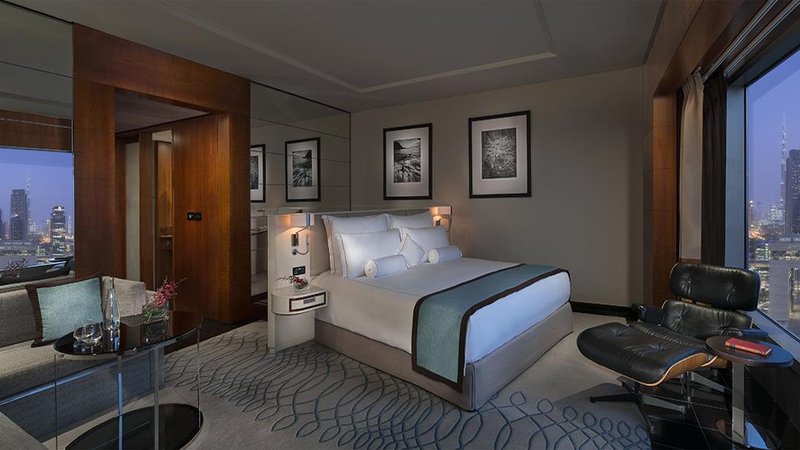 These delightful rooms feature the exceptional quality synonymous with a Jumeirah Dubai break. 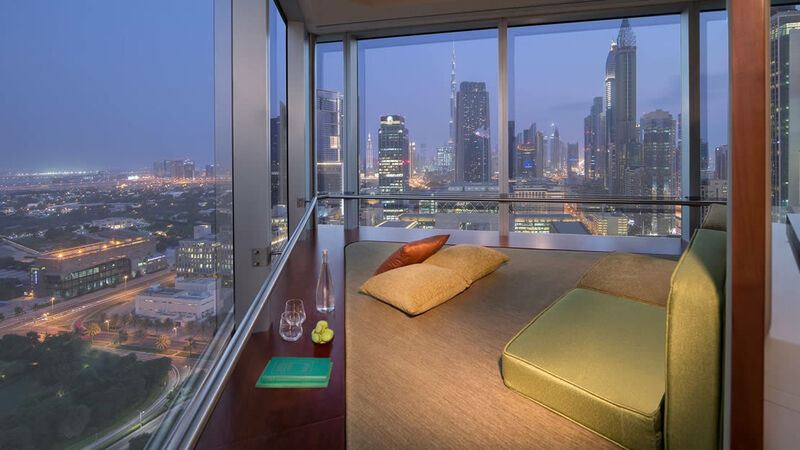 They offer superb views of Dubai's famous cityscape and boast an array of complimentary extras. A unique concept here at Jumeirah, the Chopard floor offers exclusivity for executive women only. 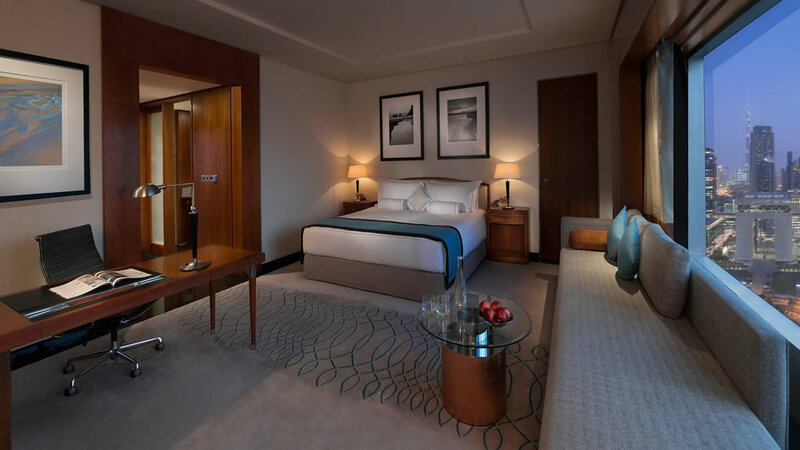 Sophisticated and luxurious, this floor is served by female personnel and as you step into your private twin or king room, you'll notice the stunning panoramic views of the Dubai skyline. There are premium Chopard amenities in a private cosmetic refrigerator, marble baths, state-of-the-art technology, and to complement, a beautiful decor appealing to the senses. 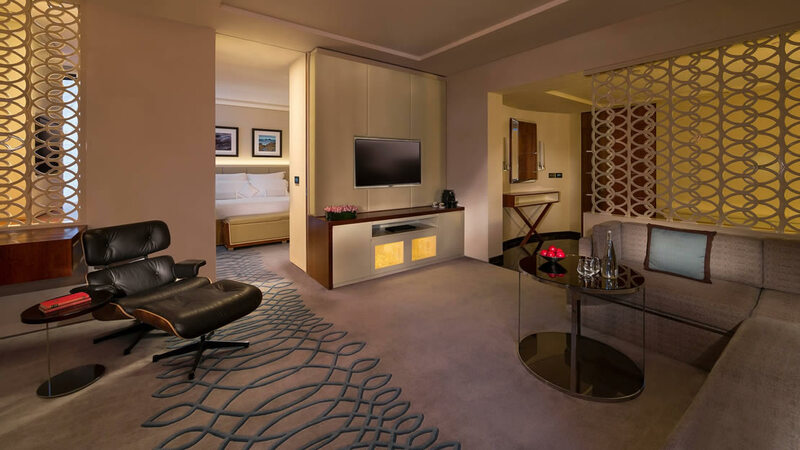 These luxurious rooms offer added privileges via exclusive access to the Club lounge. 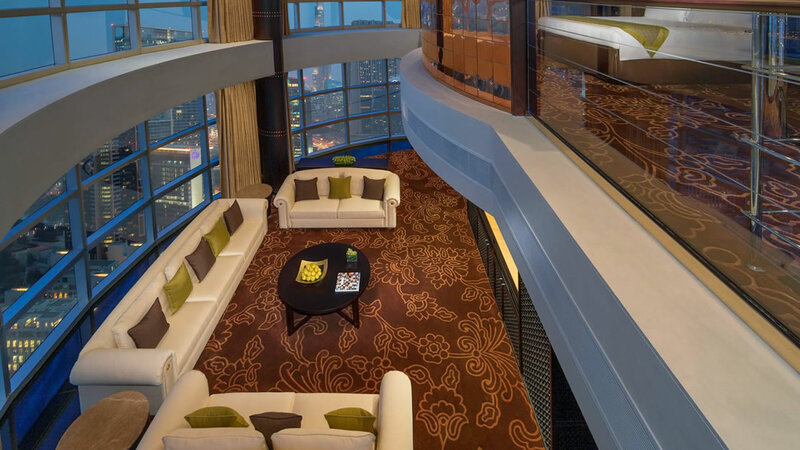 These superb suites feature spectacular views of the skyline, with separate sitting and sleeping areas. Equipped with Samsung Smart TVs, marble baths and sumptuous bathrooms, they are perfect for business or leisure guests. Featuring Jumeirah's stunning bathroom design, there is an additional guest bathroom and a separate sleeping area from the main living quarters. 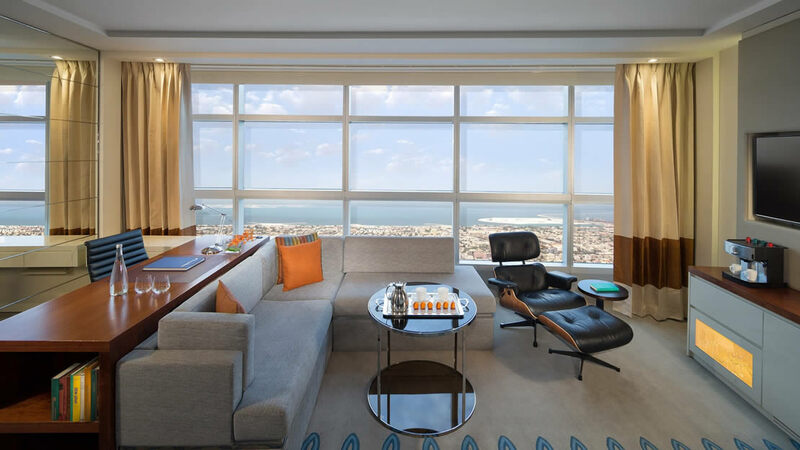 The lounge is equipped with a dining table for entertaining and the upper floor location ensures fantastic Dubai views. Inspired by Versace, Louis XVI and Modern Scandinavian style, the decor is lavishly exquisite. Two bedrooms offer complete privacy while Jacuzzi baths are on hand to relax. 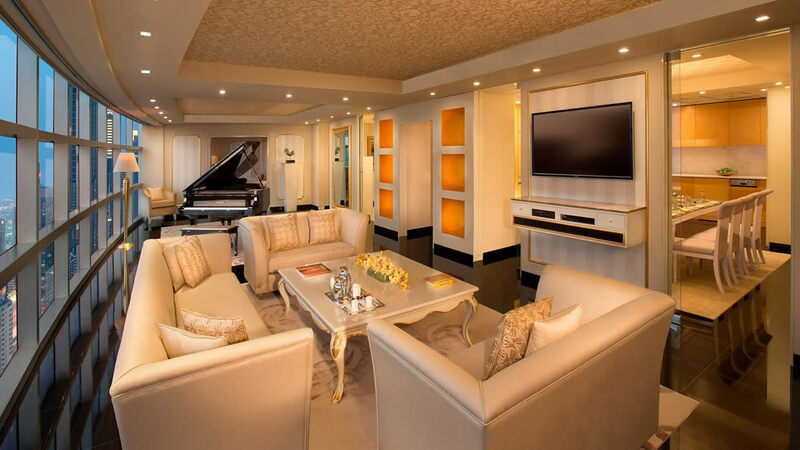 The Presidential Suite accommodates up to 4 adults and two children below 12 years. 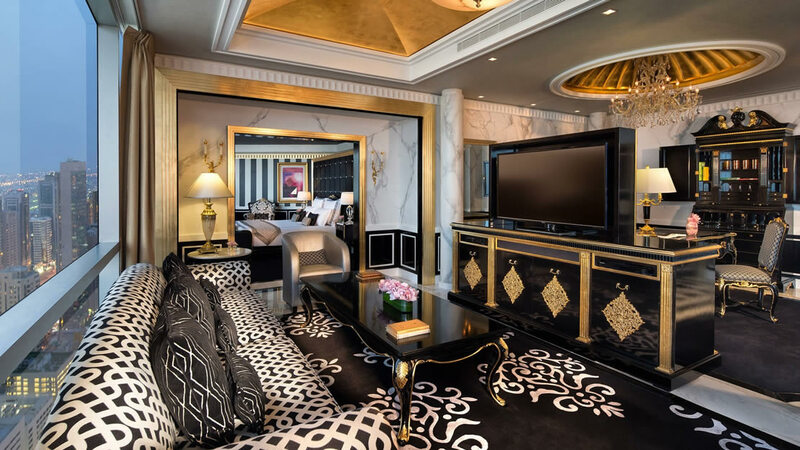 Epitomising the highest level of luxury in Jumeirah Emirates Towers, the Royal Suite is a truly decadent experience. A fabulous array of decor and design features are spread over two storeys framed by spectacular city views. This is Dubai holidaying in style. Enjoy a tantalising array of cuisine here at Mundo with a culinary journey through the Mediterranean, Middle East, India and on to Asia before arriving in Dubai with style. A healthy eating creative hub where only the most instagram-friendly fare is served. Modern decor is evident at the exquisite Hakkasan, with delectable cuisine including Wagyu beef and red snapper with ginger sauce featuring on the menu. Succulent meats grilled exactly to your liking and complimented by vegetarian, seafood and lighter menu options followed with after-dinner beverages to round off this superb steakhouse experience. Savour delicious culinary flavours from Lebanese specialties in this richly decorated venue with live entertainment and an air-conditioned marquee terrace. Designed with an open-kitchen to enjoy South-East Asian dining at its finest via an array of exciting Noodle dishes. In honour of the Parisian bistro, Dubai have aptly named a venue of their own. Located in The Boulevard, guests will instantly notice the conceptual dining experience of sound, music, image, art and food complementing each other. Dine in private booths, sat on tall bar stools, with a table d'hôtes, or alongside a minimalist bar or garden terrace. Fabulous Italian cuisine with equally fabulous views of Dubai. A plethora of bars will complement any dining experience or occasion. The pool bar offers a light meal service and is the place for spectacular sunsets. Alfie's is a gentleman's only residence where the taste for finer things is showcased. Alternatively guests can relax in the lobby lounge, at restaurant bars or unleash the star within and perform karaoke in Harry Ghatto's. Please note that children are welcome into the Club Executive Lounge from 07:00 to 18:00.